In dry hot summers the outline of six or more circular foundations, approx. 8 – 10ft Dia. can be seen on the higher ground overlooking the site of the church, (as recorded on the Ordinance Survey sheet for the area). This could indicate Beehive type huts or dwellings in a community type site. 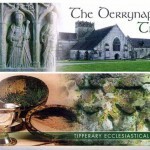 In a brief history of the Parish of Ballingarry by Very Rev. W. Canon Fitzgerald, P.P., V.F. 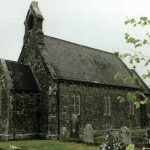 mention is made of the ancient churches of Lismolin and Crohane in ruins, Ballingarry still in repair in 1615. There is no mention of Mowney church, probably no longer in existence. Lismolin parish was at one period catered for by the monks of Hoare Abbey, Cashel. Hoare Abbey and all its possessions were confiscated by Henry 8th. Post reformation the Church was rebuilt by the reform church as a place of worship. 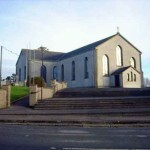 Crohane is recorded as a Parish and holy place of pilgrimage for many centuries going back at least to the year 800 AD. 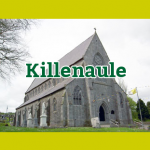 The Patron Saint of Crohane is St Sinech, daughter of Fergna of “Cruachain Muighe Abhnae”. A Celtic Saint of the 6th century. Her feast day is Oct 5th. 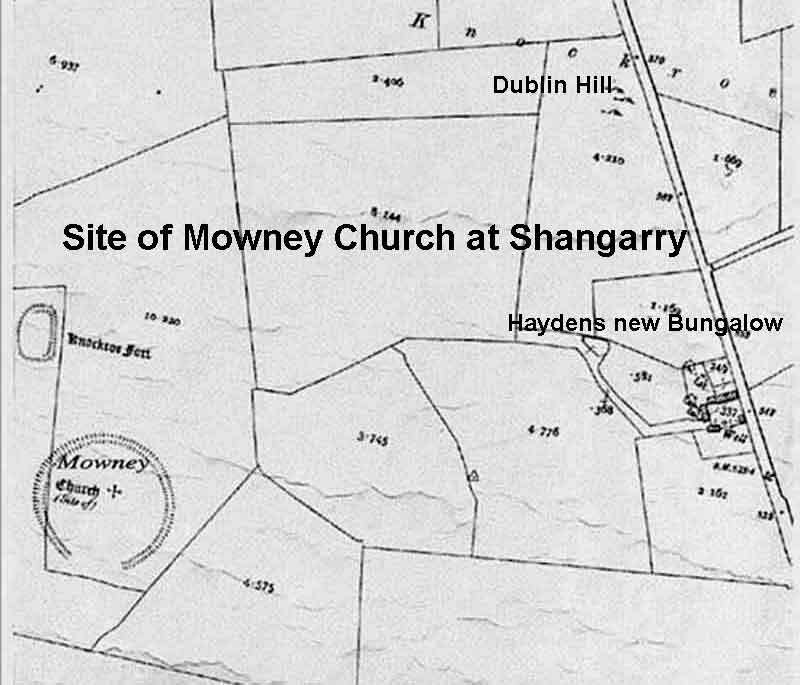 The Survey of the Barony of Slieveardagh and Comsy 1654 describes the boundary of the parish and the acreage of each townland, Shangarry (360 acres), Garrynoe (500acres), “Dundrenan” (200 acres), “Knockankit” (200 acres), and “Kilmoculloge” (200 acres), (the latter three are now part of the townland of Shangarry). 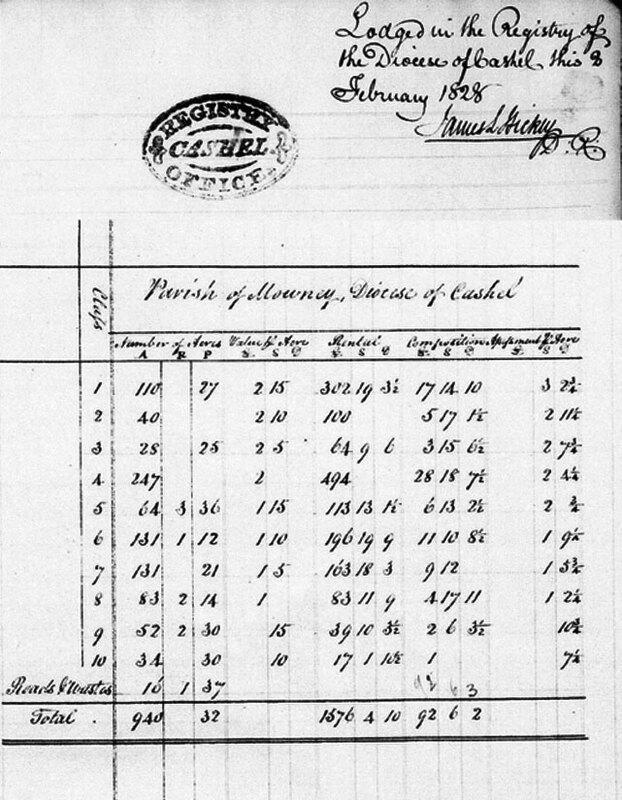 In the Primary Valuation, October 1850, Mowney parish was shown to have a total of 1,522 statute acres. The owner/landlord was Pierce Lord Viscount Ikeryn, described as an Irish Papist. His residence was Lismolin Castle now owned by the Mulally family. 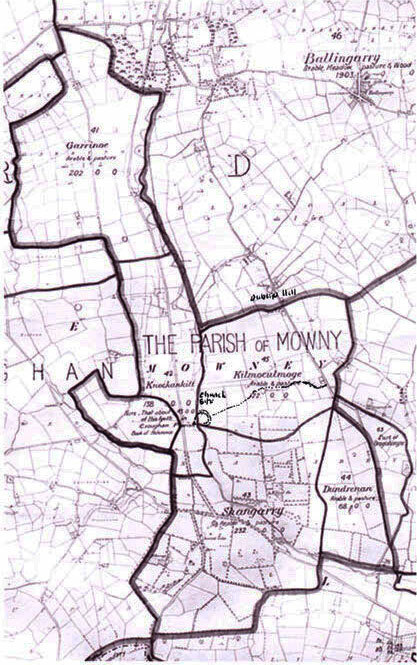 The name Mowney is derived from the Irish “Magh Obhann” meaning “plain of the river” It is interesting to note that Crohane Parish to the west of Mowney, in Irish is “Cruachan Muighe Abhanae” meaning the round hill in the Plain of the river.